Last night Luke and Isabel were wrestling in the grass like puppies and Luke split open his knee and had to get 4 stitches. He gets injured too many times for being such a safety nerd. Today Isabel had her ukulele lesson and afterward we went to a birthday party. 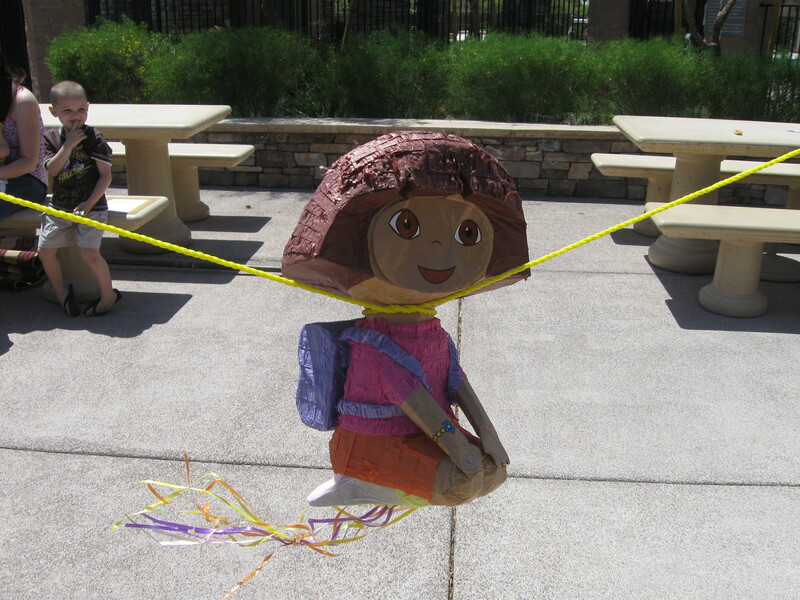 Dora fell off of her rope so they tied the rope around her neck to make pinatas even more gruesome! It was great! Vamanos! The highlight of our day was going to the City of Blue Diamond, "Population low, Elevation high" whatever that means. There are about 360 people living there. We went there to use their library and post office. It was the smallest post office I have ever seen and I was their only customer. The library was the size of our livingroom and kitchen put together and it was fabulous to know that there was no where for Sylvia to run off to. I stuck Hazel on a blanket on the floor and read Sylvia a book while Luke and Isabel looked around and read their own books. I found out from a local that the city puts on a great Fourth of July parade and party in the park. I love small town Fourth of July celebrations. We just might have to drive over to Blue Diamond and pretend to be a local on July 4th!